Sadly downloaded .mp4 doesn't work on my widows 10 computer and "gspot" program https://www.videohelp.com/software/GSpot can't identify codec needed. What players are those others using that get it to work? It worked for me flawlessly in the browser (Google Chrome) on a Windows 10 machine. Lots of people can see the animation within the forum, some have to download first and some have failed altogether. On my Linux computer Chrome works fine but Firefox does not recognise the movie. I have uploaded a smaller animation that works fine here with both browsers. Can people that had difficulties give it a try and report? your short .mp4 test animation worked fine with both Firefox, Chrome and Microsoft edge under Windows 10. I also tested the original post in Chrome. It worked fine, but it didn't play in either Firefox or Edge. The problem clearly lies with Firefox / Edge. original big .mp4 file didn't play in the same players because its codec wan't recognized. Thanks to all that have tried and responded. The positive feedbacks gives me confidence that I have nailed a big source of the incompatibility. In short: do not create mp4 files with an odd number of rows. The original video worked finely without any problems on my laptop basing on a Windows 8 system. I am on www. using Google Chrome. Thanks Wipneus. That is the most amazing animation I've seen for quite a while. For linux any distro should support. It does not drag in "everything but the kitchen sink" like VLC. (which would make it smaller than VLC in Windows also.) It has just worked for me for years. Thanks Wipneus - works great even in Firefox and its a great video - brings home the message. and thanks longwalks1 for the "mpv" videoplayer tip. The downloaded mp4s (either original or the latest one) all play fine with it. 'Sic transit gloria mundi' - in one 2-minute video. A truly stunning story. Many thanks Wipneus. I intend to use this for educational purposes. How would you like to be credited, please? 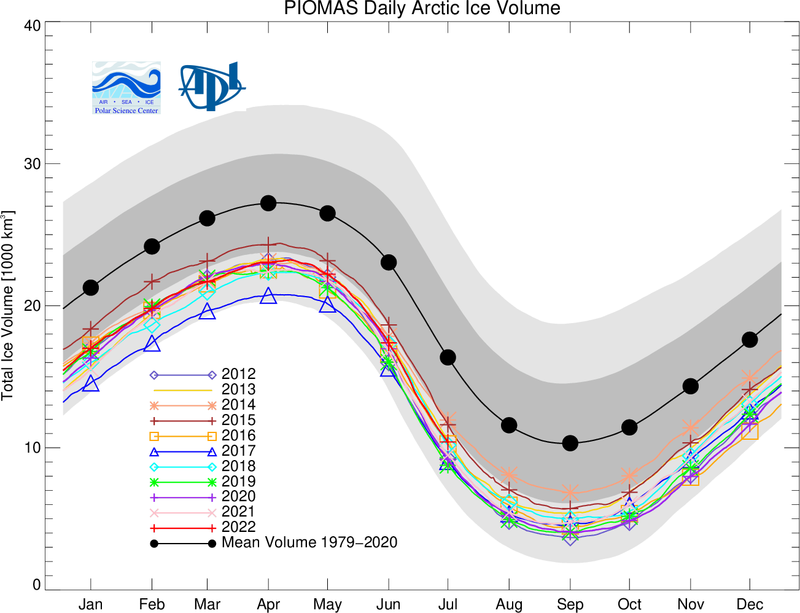 I’ve been using your PIOMAS daily arctic ice volume webpage as a dashboard and communication tool whenever the issue comes up in a conversation for the last 6 years. Thanks so much for that ! I’m not sure if it’s due to the government shutdown or just missing space for 2019, but your latest charts are missing this year’s data. I noticed the polar science center seems to have the latest data, but since your charts are much easier to read, I thought I’d point that out. Looks like the graphs have been updated, but the data not yet. Edit: Data updated too now. Have we noticed PIOMAS being 7th lowest before? PIOMAS February 2019 is up on the ASIB. PIOMAS has released the official volume data up to the end of January. Unfortunately not the daily gridded data that I use for the animation and some other graphs. Here is the volume data presented in the same format as I use for the JAXA ice extent tables and graphs. Daily volume increases mostly above average in January, hence 6th lowest became 7th lowest. And a couple of more graphs - data from Wipneus and Polar Science Center. Following that polynomial, when is it at zero gerontocrat? I have not looked - projecting any time into the future, especially that far, using these chart tools is where madness lies. I just added the x2 polynomial to see if it suggested currently volume loss is on an accelerating trend. Wipneus, using the colours in going around a 'colour wheel' provides a partial solution, at least for graphs with up to 12 colours. Interpolating to intermediate colours in an attempt to increase the number of colours doesn't work as the shades become too difficult to distinguish. However, you can reasonably double the number of colours by also including a corresponding wheel of darker colours, where the colour values have been reduced in approximate proportion from those in the original colour wheel. Attached is my suggestion for RGB colour values when doing graphs with up to 24 colours. ... or how about dashed line(s) e.g 10 yr / 5y could be dashed ? I wouldn't do last 5 dashed as they may be close. Or earlier ones (pre 2000 / 2010 even) as faded colours / very fine lines. PIOMAS has updated the official volume data. Unfortunately the ftp server with the detailed thickness data has not been serving me for some time now. I will look into that. Here are the volume and volume-anomaly graphs. Unfortunately the ftp server with the detailed thickness data has not been serving me for some time now. I will look into that..
Do you have any idea what the problem might be as yet? ftp is of course designed for automated computer data transfer, while https was designed for interactive browsing (with some incidentally downloading). Looking at the required (wget) trickery to have the same level of automatisation as before. Here is the volume data presented in the same format as I use for the JAXA ice extent tables and graphs. Still 7th lowest in the satellite record. Since there was none last month, hre is the animation of Jan-Feb 2019. Thickness maps, compared with previous years and differences with those. The Fram export graph shows near normal export figures in Jan and Feb.
PIOMAS has updated gridded thickness data. Volume calculated from this was 21.95 [1000km3] on the 15th of March. That would be the 7th lowest for the day. Here is the animation of March until sofar. PIOMAS Volume as at 15th March 21,954 KM3. Thanks tons, as always, for these amazing graphs and maps. To me, the decadal average graph tells the clearest big-picture story of the of where we've been and where we are going. Is it possible for you to verify whether Fram export is thinner than previous years according to piomas? I have given this some thought and I'm wondering what it is you really want. 2. Ice thickness unchanged but concentration less. Would calculating ice area export ( km2/month) answer your question? Obviously I will have to be careful interpreting the data. PIOMAS has updated, both the volume as the gridded thickness data. Volume on 2019-03-31 was 22.218 [1000km3], fourth lowest for the day. Here is the animation for March 2019. According to the PIOMAS model Arctic sea ice volume has been flatlining for the last couple of weeks, and may even have peaked already! Thanks, Wip. As for the volume graph, I find it hard to discern the 2019 trend line, because of the 2016 trend line (colours are too similar). But could be my eyes or monitor. Ack. That needs a fix. Here is the thickness of 31st March, with comparisons with previous years and their differences. Fram volume(!) export was about normal for the month of March. The normals are indicated by the grey line in the background and are harder to see when exports are higher.